This document provides specific instructions on how to install HelpSystems Abstract using the HelpSystems Product Loader. For general information about the HelpSystems Product Loader, see Using the HelpSystems Product Loader on our website. 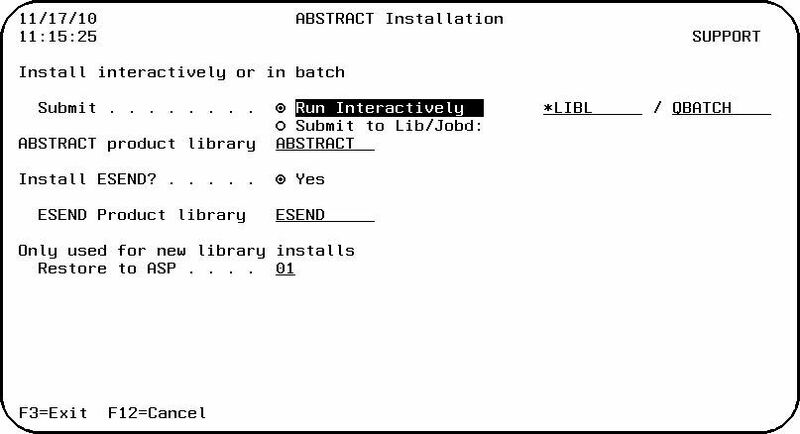 The installation process automatically installs Abstract into the default library ABSTRACT on the IBM i. Review the ReadMe document for changes that may affect your environment. This document is part of the Instruction Package available on the Abstract download page. If you are updating from Abstract 10.7.235 or higher, the installation program keeps your existing authorization code. If you are doing a new install, or your current version is less than 10.7.235, you need a new authorization code from HelpSystems. Use these instructions to install HelpSystems Abstract. This process downloads everything to your PC and loads the objects on the IBM i. Read the following steps carefully to proceed. Download the HelpSystems Abstract installer (setupAbstract.exe) from Your Account page on our website. Double-click it to start it. The installer will extract files to your PC and launch the Abstract Product Loader in a secondary window. Select or enter the IBM i where you want to load Abstract. Note: See "Loading Staged Objects on the IBM i" below for instructions on how to load the staged objects on your selected IBM i system. If this is the only installation of Abstract you are performing, click Finish. Enter option 1 next to the Load Name for Abstract and press Enter. Note: Option 2 does not apply to Abstract as a pre-check is not required. Use option 8 if you want to copy the Load command for use in a job scheduler or to submit the load now. After a series of status messages, the Abstract Installation panel displays. This install panel is used for both first time installation or updating your existing version. Enter the name of the library where you want to install Abstract. Enter the auxiliary storage pool number for new installs of Abstract..
For complete information on using Abstract, see the Abstract User Guide. Select Abstract from the list of available plug-ins and follow the remaining step to complete the installation. Start iSeries/Operations Navigator and select the system where the ABSTRACT plug-in was installed. The Navigator should prompt you to scan for newly installed plug-ins. After the scan, you should see the ABSTRACT folder beneath your system connection. Note: See the previous section if you are installing the ABSTRACT plug-in for the first time. The following information is specific to current ABSTRACT users who are upgrading their software. If you already have the ABSTRACT client software installed on your PC, start System i Navigator to update your plug-in. Select Abstract from the list of available plug-ins and follow the remaining step to complete the installation. Press Finish. Note: These versions of RDP/RDi are not supported in Windows 10. Make sure you have already installed the ABSTRACT Plug-in for System i Navigator. Do the following to install and add the plug-in to RDi. From RDP/RDi, select Help\Install New Software on the main menu. When the Install screen opens, press the Add button. Check the item displayed, and press Next to continue (there will only be one item listed, and its value will change based on the URL selected in step 3). The next Install window displays the ABSTRACT feature. Press Next. Check the button to accept the license agreement and press Finish to complete the install. When prompted, press Yes to restart Rational Developer. Note: When Rational Developer restarts, the path for the ABSTRACT plug-in needs to be manually adjusted for 64 bit Windows systems. To change the path, navigate in RDP/RDi to Window\Preferences. For versions prior to 9.5 expand the Help directory and select HelpSystems Abstract directories. For version 9.5, expand the ABSTRACT Directory Preferences directory and select Abstract Executable Path. Note: Abstract Plug-in for RDi 9.6 is only supported on Windows 10 using IBM ACS Windows Application Package. See the next section in this documentation for more on this. Be sure to first download the Abstract Plug-in for Eclipse zip file from HelpSystems, extract the contents to your desktop, and run the setupabstract.exe file. This installs several required Window modules. Do the following to install, and add the plug-in to RDi. From RDi, select Help\Install New Software on the main menu. 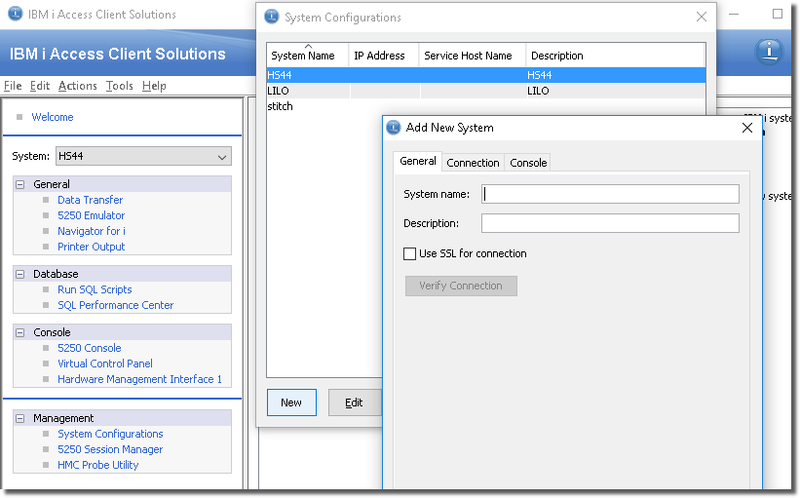 For Windows 10, the Abstract RDi plug-in requires IBM ACS Windows Application Package. IBM does not support the use of IBM i (System i, iSeries, Client) Access for Windows on Windows 10, and the Abstract RDi plug-in will not work with these older versions on Windows 10. Note: You must be registered on the IBM Entitled Software site with authorization for software downloads to gain access to the downloads pages. Contact IBM if you are having trouble finding the IBM i Access Solutions Windows Application Package. Also, Client Access must be removed before installing the Windows Application Package. Select Operating Release (ie. V7R1, V7R2, V7R3..). 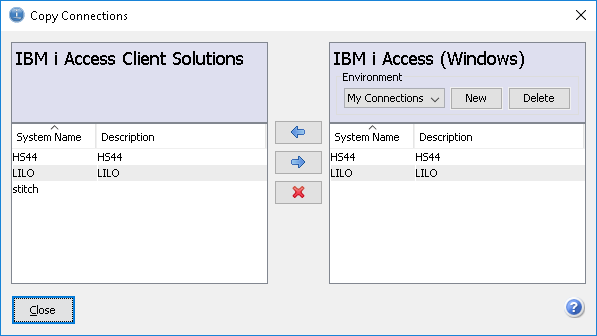 This alternate step uses the more graphical IBM Access Client Solutions to define IBM i host connections for use by the Abstract plug-in. 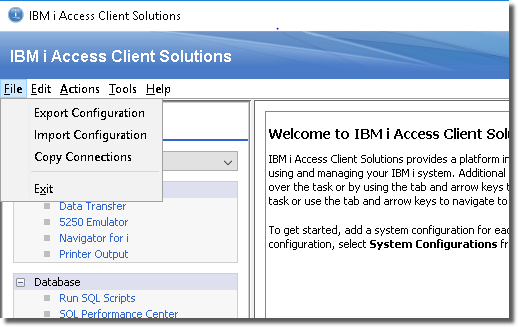 Steps 1-19 above MUST still be performed-IBM ACS Windows Application Package is required for Abstract (or Abstract Plug-in for RDi 9.6), but IBM Access Client Solutions is not. Are you using the smartest productivity tools?